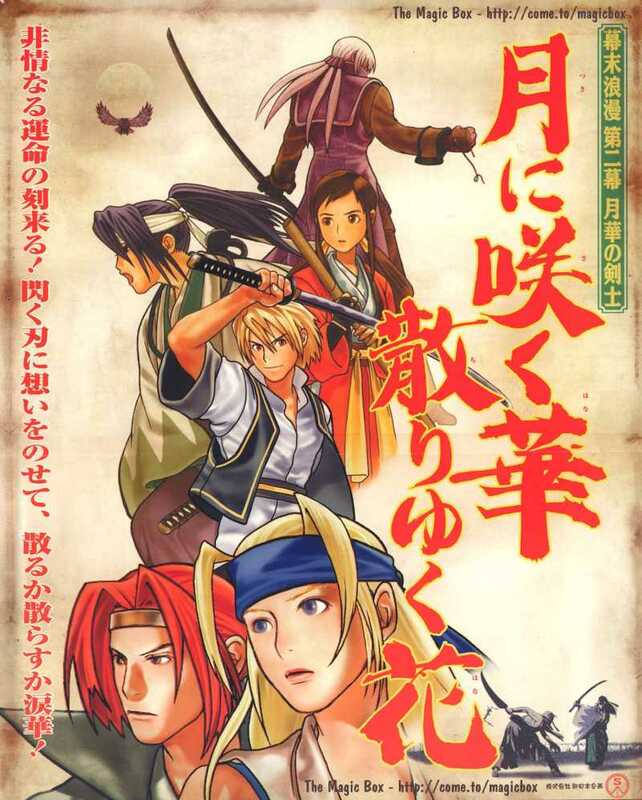 STORY: The Last Blade is set in 1863 during the Bakumatsu, the final years of the Tokugawa shogunate where a clash of ideologies were fighting to decide Japan's new society. Long before humanity existed, in a far off time of myth, death was an unknown, equally distant concept, but when death first came to the world, the "Messenger from Afar" was born. With time, the Sealing Rite was held in order to seal Death behind Hell's Gate. At that time, two worlds, one near and one far, were born. Thus the history of life and death began. Half a year has passed since Suzaku's madness, and the underworld is still linked by a great portal. Kagami's great sin is still heard as if ringing from the heavens. Our world has been called upon. Legends of long ago told of the sealing of the boundary between the two worlds. The Sealing Rite would be necessary to hold back the spirits of that far away world. However, the Sealing Rite brings together the power of the Four Gods and Sealing Maiden, for the first time properly completing the ritual. 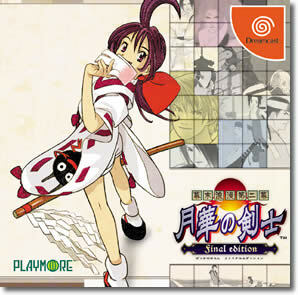 To find the Sealing Maiden, Genbu began searching in the center of the world, from which all things begin. At the same time in the underworld, in the depths of darkness, many spirits conspired, plotting to hinder the Sealing Rite. They had but one wish, to be reborn into our world. It's a battle of Power VS Speed. 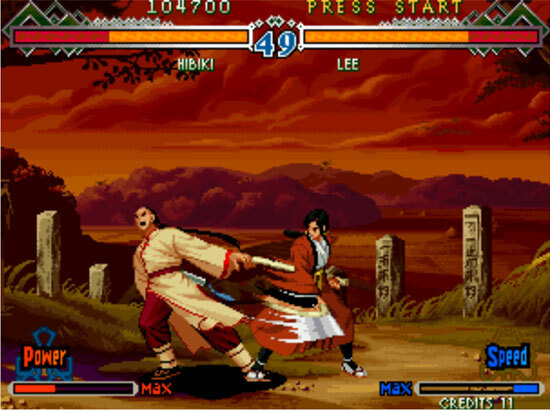 REVIEW: Set one year after the first installment, Last Blade 2 adds three new playable characters: Hibiki, Kojiroh, and Setsuna. 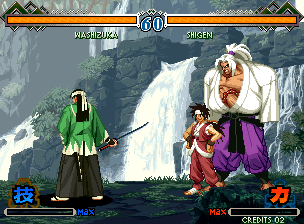 Each of the newcomers retain the "traditional" samurai style that the original Last Blade roster became known for... although, Setsuna almost looks a bit King of Fighters-inspired (and he's a badass). 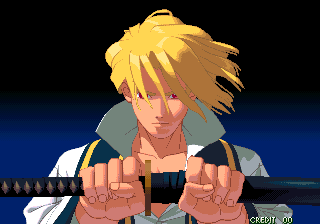 Last Blade 2's presentation doesn't disappoint, as it includes a brand new animated intro and all new superb-looking hand drawn backgrounds. Of course, game and character balance has also been tweaked from the original. 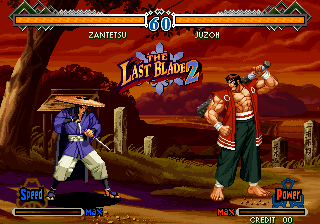 Graphically, Last Blade 2 stands out among 2D fighters of the time... even more so than the first game. 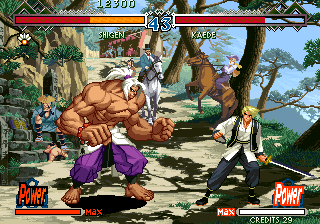 There's never a moment where Last Blade 2 doesn't look impressive. 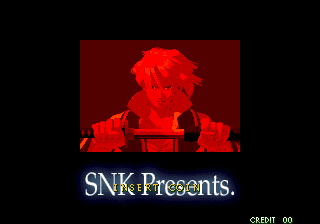 Before a battle starts, each stage presents a short cinematic intro... setting the "mood" of the stage. 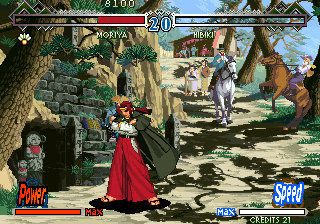 Once the action starts, the detailed character sprites and amazing hand-drawn backgrounds do the talking, filling the screen with color and personality. 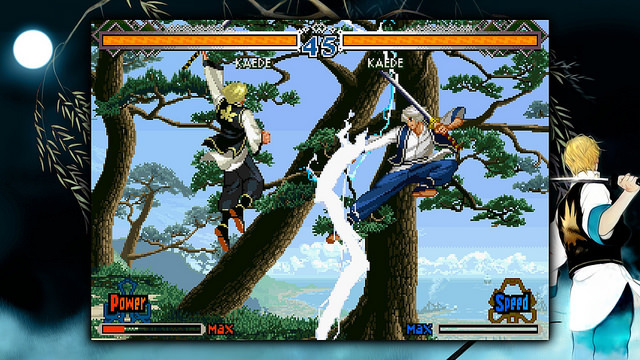 Needless to say, Last Blade 2 is one of SNK's best-looking 2D fighting games to date. The orchestral style soundtrack naturally suits the game perfectly, but I'd say some tracks are slightly too "calm" for a fighting game. The sound effects are fantastic, with the distinguishing clanging of swords, steel cutting through flesh, and powerful dialogue & battle cries from the characters themselves. It all comes together exceptionally well, offering a unique presentation all around. 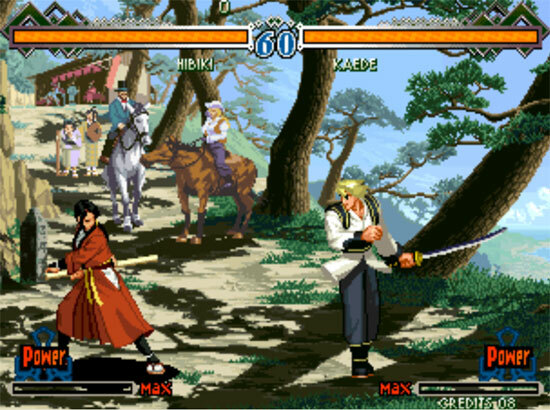 Of course, a fighting game can't survive on looks alone... but if one could, Last Blade 2 would live a long life. Out of the way brat. 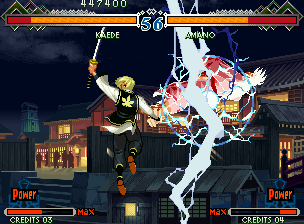 Thankfully, Last Blade 2 is still a fun and interesting 2D fighter. 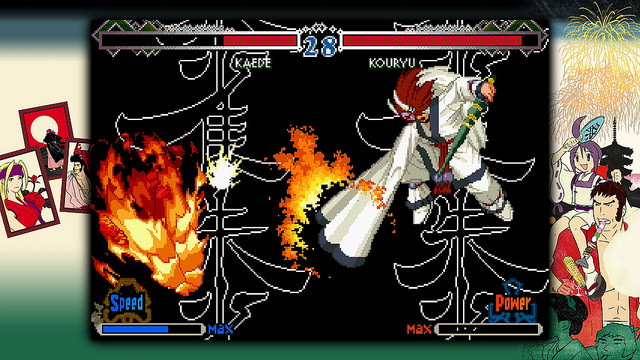 Like the prequel, the gameplay is based heavily on chain combos and setting up powerful attacks. 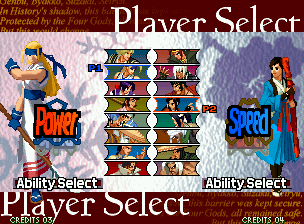 Players can still choose between "Speed" or "Power" versions of their characters, which greatly alters how a they play, right down to their special moves. 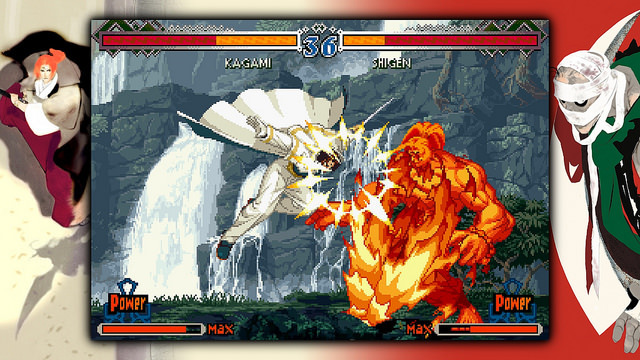 Speed Mode opens up the door to longer combo possibilities (and custom combos), while Power Mode is a more traditional and straight forward style of 2D fighting, enabling characters to perform super moves. 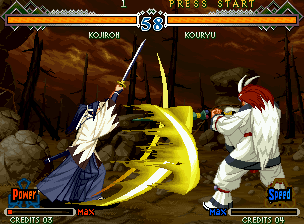 The counter/parry system also returns and feels more solid than before. 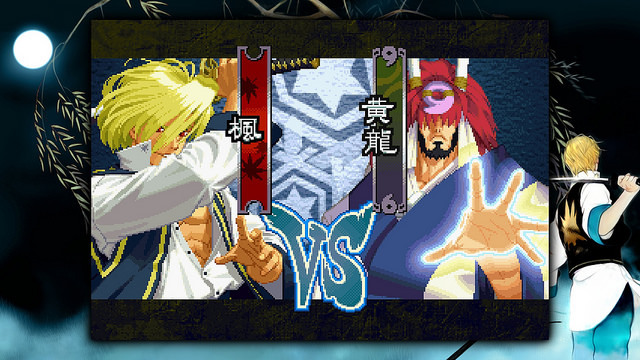 LB2's character variety is still decent, but I'd consider it a step down from the likes of Samurai Shodown series in terms of personality and interesting playstyles. LB2's roster also isn't the most balanced one around, as there are some "cheap" tricks/combos that can be used for easy victories, but overall... LB2 offers a solid 2D gameplay engine. 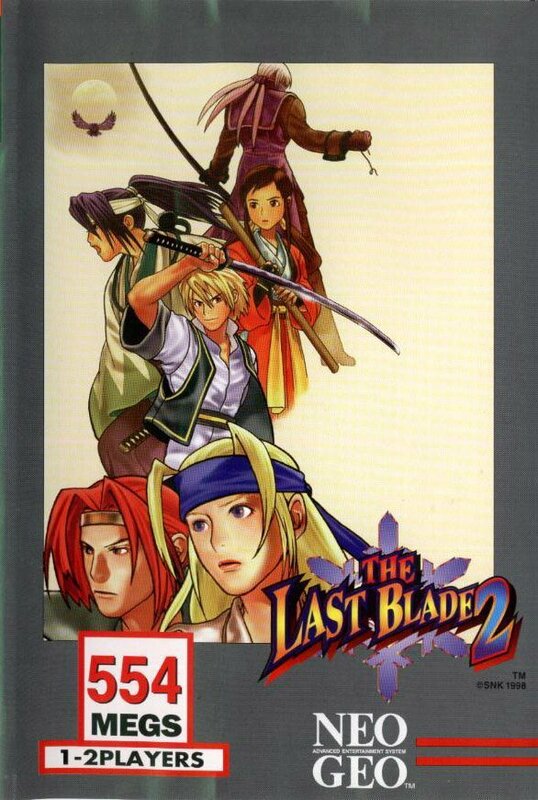 At Playstation Experience 2015, Playstation 4 and PS Vita ports of Last Blade 2 were announced. 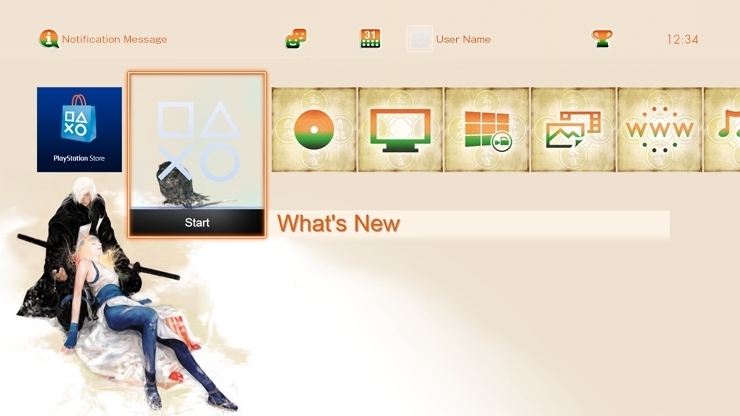 The updated ports were released in May 2016 and feature a nice variety of modes (including online play) and visual options. 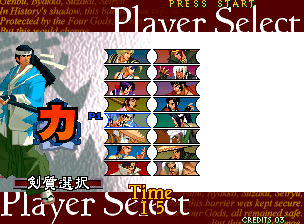 There's even an option to turn on "blood" which adds Samurai Shodown style "deaths" at the end of battles. 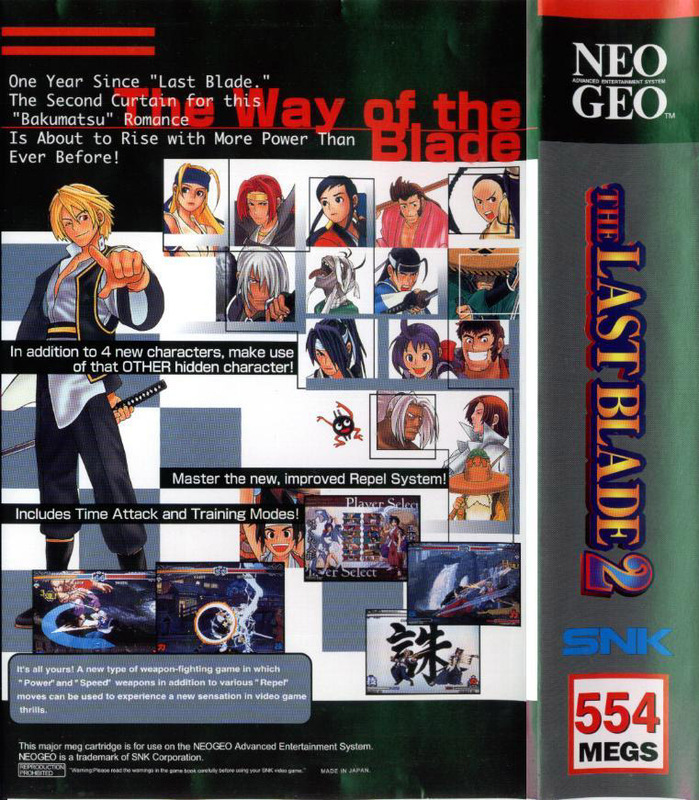 You might say Last Blade 2 was a "sleeper hit" by SNK, if there ever was one. 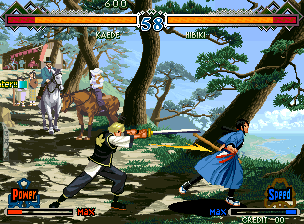 Last Blade's traditional warriors seem a bit more fleshed out this time around, but aren't the most exciting fighting game characters I've ever used (in 1998, that is). Andthe gameplay, as technical as it is, still leaves something to be desired. 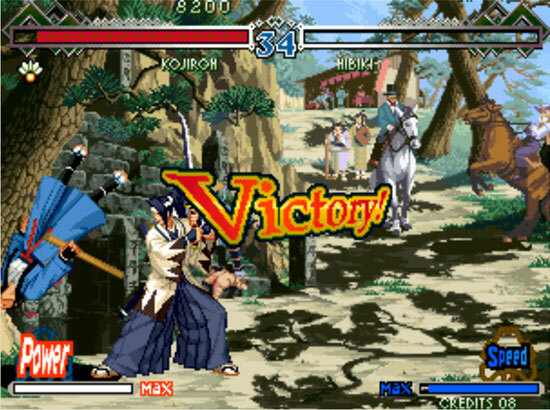 As a Samurai Shodown fan, I can't help but directly compare LB2 the epicness of Samurai Showdown 2, or the beautifully fun Samurai Shodown 4 (released 2 years prior to LB2). 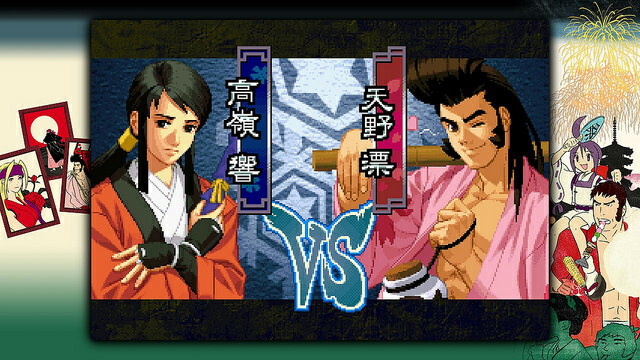 As a matter of fact, it's hard not to think "Damn, I wish I could pick Genjuro." 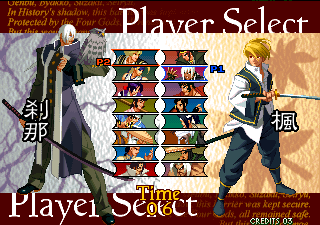 and/or "Why can't I kill my opponent," when playing Last Blade 2... but that's just me. 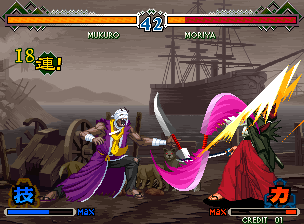 On that note, a Samurai Shodown VS Last Blade crossover really should've happened. 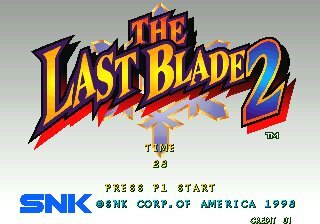 Don't get me wrong, Last Blade 2 is a beautiful game and it's even worth getting good at... but, I don't find it to be as fun or as solid as other 2D fighters from the era. 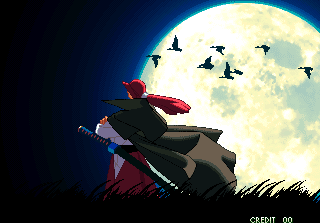 I put a few hundred competitive matches into LB2, but as far as 2D weapon-based combat goes, I strongly prefer the characters and the gameplay of Samurai Shodown series over Last Blade's.